Rising Voices » Egypt: Who is and is not Producing Citizen Media? Egypt: Who is and is not Producing Citizen Media? Note: This is a first in a series of posts highlighting the current state of citizen media in Egypt, as the three newest RV grantees begin preparations for their work. These words were written by Eman AbdElRahman for the Global Voices Summit held in Santiago, Chile in May 2010 and demonstrates that the Egyptian blogosphere is well regarded, as some of the citizen media produced has led to some positive social changes. One of its important achievements has been raising awareness about the instances of torture, which was not covered in the mainstream media. It was not until some mobile videos were filmed of victims being tortured or being given ill-treatment. Egyptian bloggers uploaded the video to the internet to attract more attention to these crimes. In addition, subjects like sexual harassment on the street had not been discussed until some videos filmed by a number of Egyptian bloggers showed mass harassment on a street in Cairo. The video was published in October 2006, even before mainstream media. Thanks to the active discussion caused by these videos, the subject of sexual harassment gained more interest from journalists, sociologists, and researchers who found that 83% of women in Egypt experienced sexual harassment. With the spread of Facebook, Egyptians used its features for mobilizations and political activism by calling for a mass strike on April 6, 2008 through a Facebook group. Although the success of this strike is still a controversial subject, the constant updates flooded Twitter, YouTube, and Facebook demonstrated the great development for practicing citizen media. When the strike repeated in both 2009 and 2010, online media and digital devices were used effectively for advocacy, as activists were able to spread information through cell phones about the 92 detainees and to determine their locations, and post the information online. Who is Producing Citizen Media in Egypt? One of the first producers of citizen media were young activists, who attended protests in 2005 and reported on the demonstrations and the violent reaction of the police. They documented the events with digital cameras, mobile phones, or reported on it in text usually in Egyptian slang. Meanwhile, such news and images were not broadcasted in the state-run media, and private television channels were often prevented from covering the protests. Since citizen media was born as a relatively freer outlet to publish what the mainstream media ignored or did not cover, many unvoiced groups took to citizen media, such as Bahaa'is, Egyptian Christians (Copts), the LGBT community, and Muslim Brothers. Later, the success of citizen media attracted more groups to cyberspace, since blogging, uploading videos to YouTube, and writing a Facebook note were all easty to do and did not require deep technological knowledge. Since the end of 2007, the Egyptian blogosphere contained blogs written by left-leaning individuals, university students, Bedouins of Sinai, and a small number of Nubians. Today, Egyptian blogs represent approximately 30% of the Arab blogosphere. 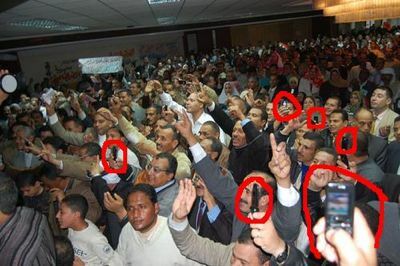 Who is Not Producing Citizen Media in Egypt? According to a recent study, over 50% of Egyptian bloggers are between 20-30 years old. If you were to look for “child” bloggers, you would find blogs named after kids, updated by their parents who like to publish pictures of their children. However, if you would like for a child author of a blog, then most likely you may not find one. It is also the same percentage 50% of those in Cairo that can count on internet connection, which for many people is such a normal situation, as the capital consists of 5 governorates with a population of over 20 million people. However, a territory like Upper Egypt is almost not mentioned neither in traditional, nor new media because of high rates of poverty, illiteracy, and a weak infrastructure, all of which makes Upper Egyptians underrepresented online. Despite having 27% of the Egyptian blogs written by females, we could say that most of women are underrepresented online, as looking at the percentages more closely would reveal that the majority of this 27% are Cairenes and young (between 20-30). This is reflected obviously in their opinions and the subjects they tackle. Meanwhile in contrast, a Bedouin, illiterate, or older women are absent online. The well-known initiative Kolena Laila tried to bring these voices to cyberspace, by sharing podcasts or videos with them, but there remains much more to do to ensure these voices are represented. In general, a number of local NGOs in Egypt are concerned with training bloggers on documenting, legal protection or human rights, so they can produce better quality of citizen media with a level of protection. But most of them targets those who are already engaged with citizen media. For example, around 3 years ago the Arabic Network for Human Rights (ANHRI) started a project to get offline activists into the blogospher, ‘Katib’ could be a first of its kind in the country to teach lawyers and community organizers how to blog, and give them a free blog with a constant technical support. Pingback: This Week in Street Harassment… | Hollaback!